You may have a not-so-healthy view of stress according to a recent study from the American Psychological Association. Ninety percent of adults believe stress can contribute to the development of major illnesses and nearly 40 percent claim their stress levels have increased over the past year. 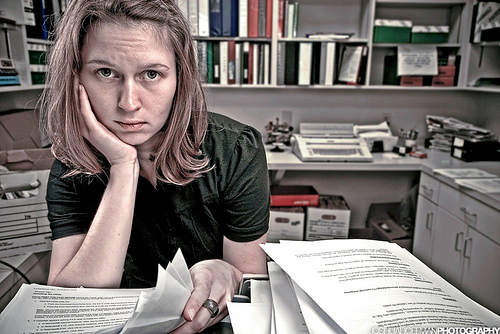 The study concludes people manage stress in unhealthy ways. Surprisingly, more than 30 percent think stress has little impact on their physical health, and around 30 percent also believe they are doing a good job managing their stress. The choice is clearly yours to make positive behavioral changes by getting yourself organized. Now, ask yourself a question: How do you fight stress? Defeating the Parkinson’s Law … try to take care of the task as soon as possible. Once it’s off your list, it is not wasting your mental energy anymore. I handle stress by getting to the gym 3 times a week during my lunch-hour, even if I only have time for a 20-min workout. I have it in my Outlook calendar and everybody in my office knows and trys not to interfere with my self-appointment. Even my husband knows not to ask me to lunch on those days! You would be surprised at how well people understand your priorities. I come back energized and can plow through the work at twice the pace, plus I feel so good about myself! Go for it! I handle stress by scheduling daily meditation just like I would any other appointment. The phone is off, the headphones are on and I listen to the sound of the ocean. 15 minutes a day helps a lot. That’s a great tip, Adrienne. Creating a few minutes of pure solitude is a great way to reduce stress.